Learn how to use Siri Shortcuts to create OmniFocus actions and template-based projects with ease, efficiency, and accuracy. This session, led by automation expert Rose Orchard, is a follow up to Automating OmniFocus 3 Using Siri Shortcuts: Basics. Rose reviews some of the basics, including how to install a Siri Shortcut and the TaskPaper syntax, then takes us on a deeper dive into more advanced productivity workflows. 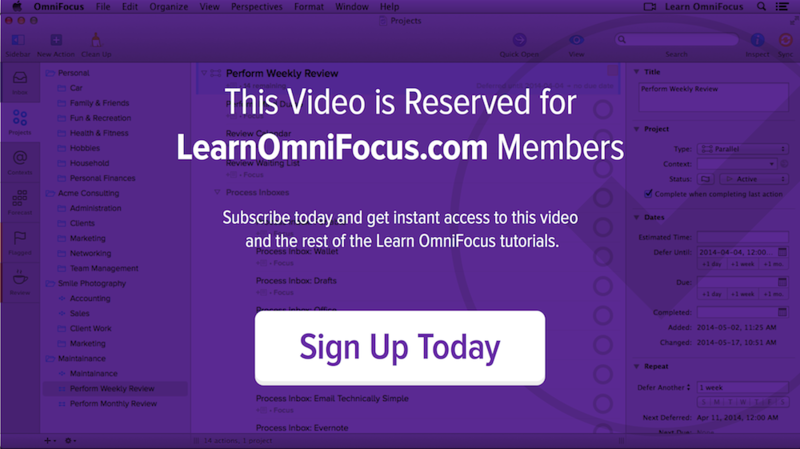 You'll learn how to create OmniFocus actions that prompt you for input and how to create projects based on text-based TaskPaper templates. You'll also get a taste of how a single Siri Shortcut can interact with multiple apps. The Drafts app is prominently featured in this session. It's a natural complement to both Siri Shortcuts and OmniFocus and makes the process of creating TaskPaper actions and projects quick and convenient. While there's an optional paid upgrade to Drafts, everything that's shown in this session can be accomplished with the free app. Customizing and extending existing Siri Shortcuts. Using the TaskPaper format to create template-based projects in OmniFocus. Using Drafts for iOS to create and edit TaskPaper text. Creating Siri Shortcuts that prompt you for information (e.g. someone stored in your Contacts database, the date of an event, and the destination of a trip) and create a customized OmniFocus project in a specified folder. Using default date values to streamline data entry. Creating Siri Shortcuts that prompt you to choose from a menu of options. Creating Siri Shortcuts that interact with multiple apps (e.g. add a project to OmniFocus and an appointment to Calendar based on inputed dates). Installing and using the OF Taskpaper action group for Drafts that was created by Rose Orchard. You'll find the Siri Shortcuts that were referenced in this session in our OmniFocus Siri Shortcuts Directory. You're encouraged to download and experiment with these examples. OmniFocus Actions for Drafts 5 — The OF Taskpaper action group, that was created by Rose Orchard, is available in the Drafts Action Directory. Once you've installed Drafts on your iPhone or iPad, open up this page on your iOS device and tap the Install button to add the action group to Drafts. Using Drafts 5 Taskpaper with OmniFocus — This post by Rose Orchard provides more information on using Drafts 5 alongside OmniFocus. OmniFocus TaskPaper Reference Guide — To learn more about the text-based TaskPaper format, check out the Omni Group's comprehensive OmniFocus TaskPaper Reference Guide.